NOVEMBER/DECEMBER 2017 | www.broadbandcommunities.com | BROADBAND COMMUNITIES | 99 and leisure and recreational offerings in this visually stunning, physically demanding, naturally blessed region. e lack of high-speed broadband services has kept the region from attracting technology-sector jobs and businesses. However, the digital divide is no longer confined to the tech sector. Every industry now requires high-speed, reliable internet access for growth. Local businesses of all kinds are deprived of opportunities to compete elsewhere when they are not able to access information and business openings. Internet access is not the only measure that development consultants should consider. It is equally essential that access to high-speed internet services be available at a reasonable cost. Informal interviews with local leaders indicate that the Appalachian region lags the rest of the United States in terms of affordability of high-speed internet services. is is even more acute for individuals and small businesses. Obviously, steps must be taken to build local capacity in any attempt to bridge a digital divide. 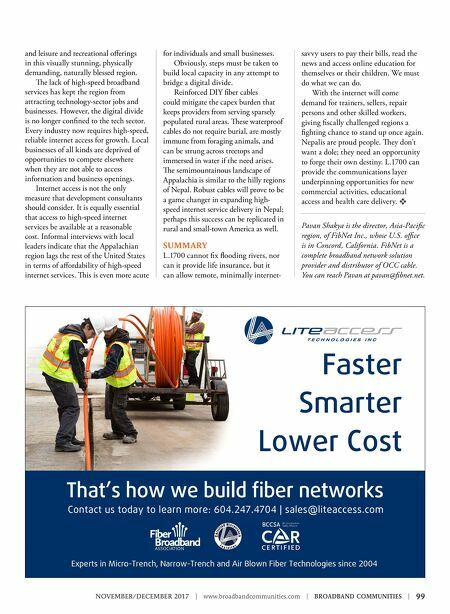 Reinforced DIY fiber cables could mitigate the capex burden that keeps providers from serving sparsely populated rural areas. ese waterproof cables do not require burial, are mostly immune from foraging animals, and can be strung across treetops and immersed in water if the need arises. e semimountainous landscape of Appalachia is similar to the hilly regions of Nepal. Robust cables will prove to be a game changer in expanding high- speed internet service delivery in Nepal; perhaps this success can be replicated in rural and small-town America as well. SUMMARY L.1700 cannot fix flooding rivers, nor can it provide life insurance, but it can allow remote, minimally internet- savvy users to pay their bills, read the news and access online education for themselves or their children. We must do what we can do. With the internet will come demand for trainers, sellers, repair persons and other skilled workers, giving fiscally challenged regions a fighting chance to stand up once again. Nepalis are proud people. ey don't want a dole; they need an opportunity to forge their own destiny. L.1700 can provide the communications layer underpinning opportunities for new commercial activities, educational access and health care delivery. v Pavan Shakya is the director, Asia-Pacific region, of FibNet Inc., whose U.S. office is in Concord, California. FibNet is a complete broadband network solution provider and distributor of OCC cable. You can reach Pavan at pavan@fibnet.net.